The Park Foundation was created by NC State alumnus Roy H. Park ’31, who dedicated the foundation to supporting worthy causes related to education, media and the environment. In 1996 the foundation established the Park Scholarship, which brings exceptional students to NC State on the basis of their outstanding accomplishments and potential in scholarship, leadership, service and character. The Park Scholarship provides a four-year scholarship, a computer stipend, enrichment grants, specialized faculty mentoring and a wide variety of experiential learning opportunities. The program prepares Park Scholars to make lifelong contributions to the university, state, nation and world. 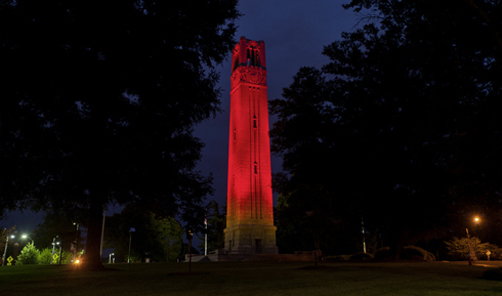 NC State lights the Memorial Belltower a vivid Wolfpack red to celebrate the university’s proudest occasions and achievements, such as commencement, prestigious student and faculty academic honors, athletics championships and Founders Day. Park Scholars are some of the most distinguished students on campus. They hold leadership positions in student government, honorary societies and service organizations; they receive competitive Goldwater Scholarships, Soros Fellowships and Fulbright Grants; they go on to graduate school at prestigious universities including Harvard, Princeton and Oxford; and they find careers at successful companies including Apple, Deloitte, Google and Lockheed Martin. Park Scholars are also noted for their devotion to service. Service Raleigh, the largest student-run service endeavor in the Triangle area of North Carolina, is an annual day of service led jointly by Park Scholars and NC State Student Government. The Krispy Kreme Challenge, which benefits the North Carolina Children’s Hospital, was started as a lark by a group of Park Scholars in 2004. They wanted to see if they could run two and a half miles from the Memorial Belltower to the nearest Krispy Kreme location, where they would then wolf down a dozen doughnuts before running back to the Belltower — all in less than an hour. Since then the charity race has raised more than half a million dollars for the hospital. For the first 17 years of the Park Scholarships’ existence, the Park Foundation funded the program through annual grants. Now that the program has proven its viability and has demonstrated the positive impact that Park Scholars have on the world around them, the foundation is taking another generous step by giving a $50 million gift to start an endowment for the scholarship. The endowment provides part of the program’s funding on an ongoing basis, but a funding shortfall still exists. The Park Foundation has agreed to continue providing annual grants to cover budgetary gaps while the program seeks donors to complete funding of its endowment. A gift to the Park Scholarships is more than a gift; it is an investment in remarkable students who repay that investment many times over in their efforts to solve the grand challenges of society. Park Scholars do an exemplary job of carrying out NC State’s mission to create economic, societal and intellectual prosperity. Let us know if you'd like to receive news about the Park Scholarships program and our distinguished scholars. High school students, parents and guidance counselors can learn more about the Park Scholarships application and selection process. The Park Foundation’s generous gift is only the beginning. Help us build our new endowment to a sustainable level.